Have you ever used the random number generator at Random.org? I use it every month to determine the winner of our once-a-month First Friday Giveaway. It’s a great tool, and it’s easy to use. All you do is type in a minimum number, which for our giveaway is 1. And then type in a maximum number. This month’s number was 265. Click “Generate” and voilà—you have a winner. And who is this month’s lucky winner? That would be Ally C., comment number 246! Congrats, Ally! Another of my favorite online tools for random selection is Random Name Picker. 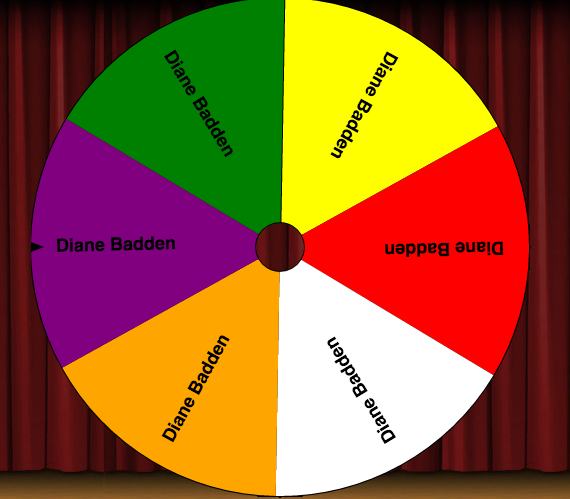 It’s a flashy wheel you can program with student names, classroom rewards, free-time choices, and so on. There are three things I especially like about it: it’s free, each spinner can be saved, and did I say it’s flashy? Also, after a random selection is made, you can remove that selection from the wheel so it’s not selected again. Take a look at the spinner I made. I just spun to see who gets a chocolate treat. Well, I’ll be. That would be me! Such a wonderful “random thought”- LOL!